Well you see all sorts in this trade but this was a first for me. 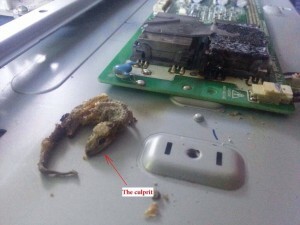 I’m in touch with fellow engineers from around the world and this poor Gecko was found in the back of a TV in Albania. The TV was wall mounted and should have had a cover fitted where the stand slots in, so along comes the Gecko and finds easy access into the TV through this large gap in the bottom. It found a nice warm place to hide on the inverter transformer, unfortunately it would have been electrocuted by the high voltage as soon as the TV was switched on and then slowly cooked as it warmed up. The customer had complained of an awful smell just before the TV died! A long time ago when I was an apprentice I found a mouse that had made a nest inside the EHT can of an old Valve GEC colour TV, the poor thing had been fried by 24,000 volts!